I got this! Nope, don’t need your help. Figured this one out on my own. How many times have we spoken those words and then realized that we really didn’t have it all figured out and things got out of control? How long did it take us to realize that we didn’t have all the answers? This is how things are sometimes concerning our walk with God, especially when we are the ones who got ourselves into trouble. We start off good and are walking in the right direction and then for some reason we stop seeking God and devise our own plans which leads us completely astray. I call this issue “Independent Mountain Walks” . We are on course with God. We have sought out His will and are walking along with good intentions and headed for the things He wants us to do and the a suddenly happens. Suddenly you think you have a better idea or an easier way of getting to the top of the mountain. 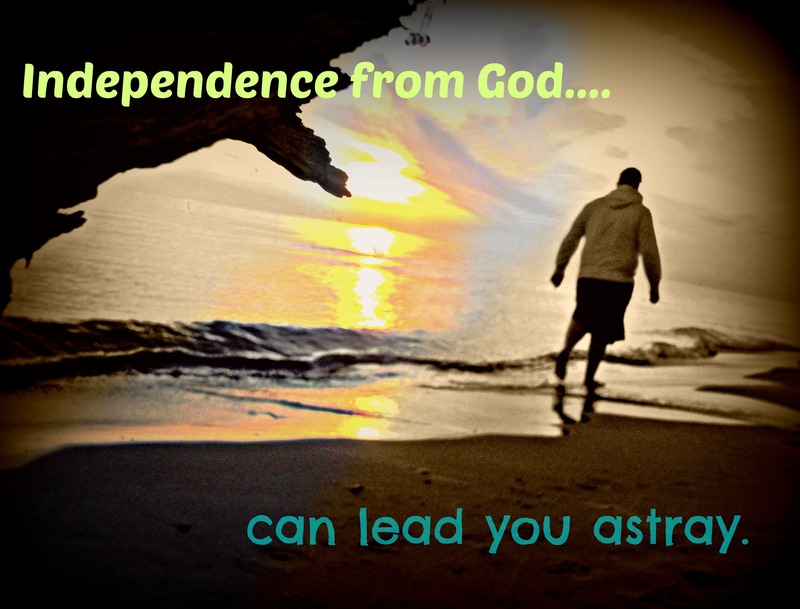 As you begin to think more independently, you no longer are relying on God for any answers to your circumstances. Pretty soon you are on your second time around the mountain instead of getting to the top of it. Hmmmmmm….wonder how this happens, Satan. As mentioned before Satan is out to kils, steal and destroy and sometimes it just takes one simple sentence or word for that matter to enter our minds, causing us to get confused, which leads us astray. Pretty soon, after no conversations with God, we feel at this point that we are the ones who have to get ourselves out of trouble when in reality we just need to admit our wrong turn and look to God for the answers. Sometimes because of our own selfish pride we can’t even talk to God. Those insecurities start flooding in and as we are trudging through the mountain on our own, we lose all hope. Well friends, there is hope. There is always hope in Jesus. He says He will never leave us or forsake us. He is always there leading us through our trials even if at times He seems to have disappeared. We need to come to the realization that blaming ourselves for getting lost will avail to prosperity. We need to tell Satan and his gang to get behind us and start conversing with God again. There is no condemnation for those who are in Christ, there is no reason why we can’t come before God and say, “I am sorry Lord, here, take my hand, lead me up the mountain.” He will gladly pick up right back were you ended the conversation and guide your steps. Are you stuck going round and round and round the mountain? Have you lost all hope? Is there no end to the vastness of this mountain you are traveling on? Well then, stop, look and listen. There is a voice calling out to you. There is a hand reaching out to guide you. His name is Jesus and He is right beside you. Nothing you have done will separate you and God. He loves you right where you are on that mountain, no questions asked. Take a moment right now and choose to get back on the right path, it’s not too late. Down with the flu…here is another repeat!